One of the biggest challenges to discovering a cure for the human immunodeficiency virus (HIV) is when the disease becomes dormant — hidden and inactive within the human body. Modern therapy can practically wipe out the virus, but stores of latent HIV soon become active and multiply all over again. 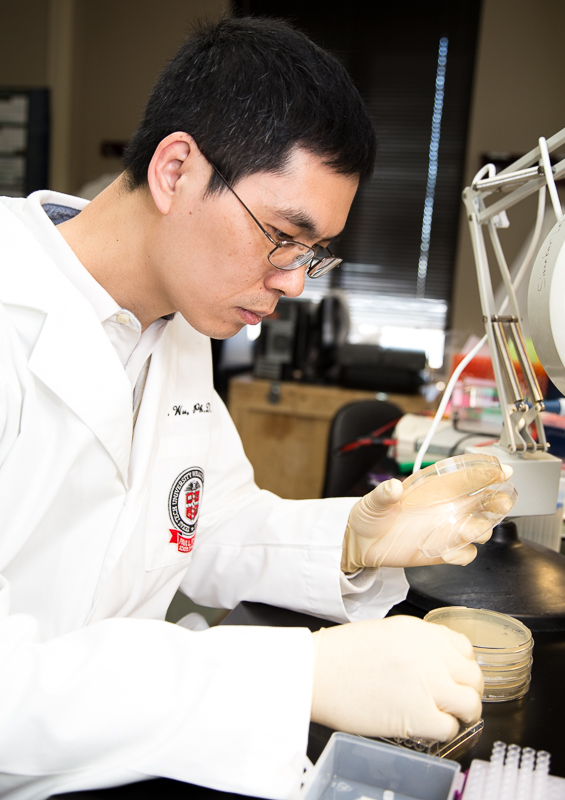 “We need to find a way to wipe out latent HIV in order to find a cure for this disease,” says Haoquan Wu, Ph.D., a biomedical scientist at Texas Tech University Health Sciences Center El Paso (TTUHSC El Paso). Wu recently received a two-year, $420,000 grant from the National Institute of Allergy and Infectious Diseases (NIAID) to study how HIV perseveres in humans. Wu’s hunch is that certain human genes play a role in the virus’ persistence. To find out, Wu will conduct a genome-wide knockout screening that attempts to identify which human genes enable HIV to become latent. Wu and his team will specifically knock out, or deactivate, each gene in the human genome to identify which enable HIV’s dormancy. A drug that targets the specific gene, or group of genes, could then be developed to target the genes in humans, reactivating latent HIV reservoirs in the body. These could be then detected and eradicated. The team plans to use CRISPR-Cas9, a technology that allows scientists to cut and deactivate genes, to conduct their work. Wu and a team of TTUHSC El Paso colleagues have conducted similar research in the past. In 2015, the researchers identified certain human genes that help West Nile virus (WNV) kill its host’s cells. This provided the first glimpse of how host factors can be hijacked by the virus to kill the host’s own cells. Their findings were published in the journal Cell Reports.